1. Only one free item per transaction is allowed. 2. FREE item cannot be exchanged for cash. 3. This promo cannot be used in conjunction with other promos. 4. Available in all McDonald’s stores nationwide for front counter, drive-thru, take-out and Dessert Centers purchases. 5. 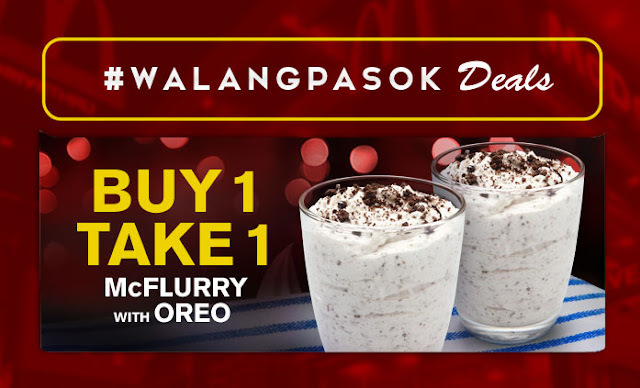 Not applicable to mini McFlurry with Oreo, McFlurry with Oreo Matcha and McFlurry with Sans Rival. 6. Not available via McDelivery. 7. Applicable to all McDonald’s stores and Dessert Centers nationwide. Per DTI-FTEB Permit No. 5623. Series of 2018.